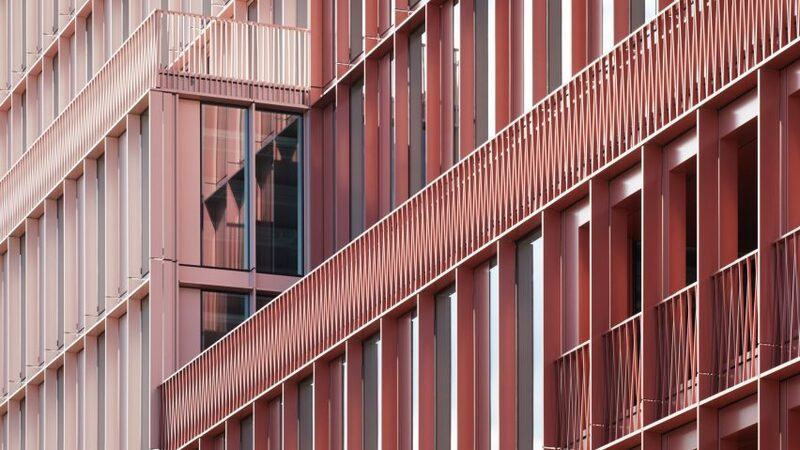 London firm Duggan Morris Architects has completed an office building in London, featuring an aluminium facade in this year's trendiest colour. R7 is an 11-storey-high building in the fast-developing area of King's Cross. Its gridded facade is finished in two shades of pink, one of which is a close match to 2017's hottest hue, millennial pink. However Duggan Morris Architects director Joe Morris said this came about by chance. The aim was to use colour to differentiate between the two halves of the building, but to make them also feel like part of the same family, separate from other new buildings in the area. "The pink itself wasn't ever a proposal, it was more coding to demonstrate the site strategy we'd come up with," Morris told Dezeen. "It was a really intuitive, natural response to a whole series of conditions we'd created through the design process." "It was a diagrammatic response to effectively exemplify the strategy, and in the end it kind of just stuck." The two shades of pink chosen echo the rosy hue of the bricks of the nearby St Pancras Hotel, an ornate 19th-century building that sits at the southern edge of the regeneration scheme area. "Pink is a colour that we use a lot," said Morris. "It's quite a human colour, it's a colour we intuitively reach out for. We wanted it to have a more domestic rather than corporate appearance." The two side of the building rise to different heights, determined by the levels of the adjacent Central Saint Martin's (CSM) university building. "Where CSM is low, our building goes high, and where CSM is high, our building steps down," explained Morris. 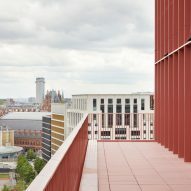 The stepped shape of the two buildings creates outdoor terrace spaces in the setbacks, so different levels have access to outdoor areas with views out over the city. The aluminium facade comprises a series of fins and balustrades, intended to reference the Victorian industrial buildings that characterise the area, such as the iron gas-holder structures, and the various old warehouses. The pink serves both practical and prettifying purposes. 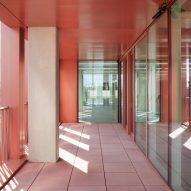 This powder-coating will protect the aluminium from corroding in the pollution-filled air of a major London transport hub, while the soft sheen finish will reflect the changing light throughout the day. The ground floor of the building is given over to public space. 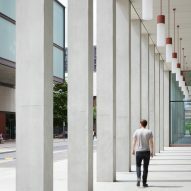 Here, exposed columns and soffits form a covered walkway leading from Handyside Street though into a seven-metre-high entrance lobby. A restaurant, a spin-fitness studio, and a three-screen Everyman cinema are all due to open in this space. It will also be used to exhibit art produced by R7's creative neighbours. Office spaces occupy the floors above, and are currently rented by fashion brand New Look and financial technology company XTX Markets. 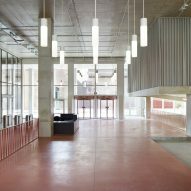 Duggan Morris designed the office spaces to be fully flexible, allowing units to be let in configurations that can suit a variety of small- and medium-sized businesses. The floor plans operate on a 1.5-metre grid pattern, which is reflected in the grid pattern of the facade. The exterior ring of each floor has been cast in concrete, but "soft spots" formed of plywood and aluminium panels can be removed and reinstated as needed, via the goods lift. For instance, one tenant has removed all of its soft spots and added interior staircases to connect all of the six floors it occupies. 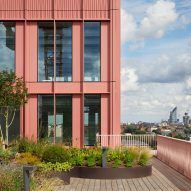 The building is expected to receive a BREEAM sustainability rating of Outstanding, thanks to the building's low-carbon energy supply, and the control over solar gain provided by the facade fins. 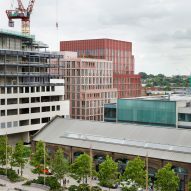 Morris hopes that R7 will add to the "campus atmosphere" of the King's Cross area, linking up to the adjacent mixed-use R8 building, which includes affordable housing and offices for start-ups. To the east, parts Q1 and Q2 of the masterplan house more offices and a sports hall. 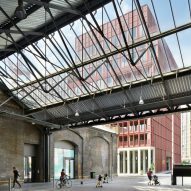 Developer Argent won planning permission for the 67-acre King's Cross Development to in 2006 after extensive consultation with Camden Council. Argent then appointed Allies and Morrison and Porphyrios Associates to draw up a masterplan for the site. Central Saint Martin's was one of the first buildings to complete. Meanwhile Google is planning to build its new headquarters in the area, designed by BIG and Heatherwick Studio. Heatherwick is also working on a new shopping centre, by transforming a collection of Victorian buildings. And last month, British designer Tom Dixon announced plans to relocate his studio, showroom and cafe to King's Cross. Duggan Morris Architects was founded by Joe Morris and Mary Duggan. The studio recently announced plans to separate into two, with Morris becoming principal of Duggan Morris, and Duggan leaving to form Mary Duggan Architects. Past projects by the studio include a canal-side housing block in west London built from handmade bricks and a school swimming pool in Buckinghamshire with a folded timber roof.